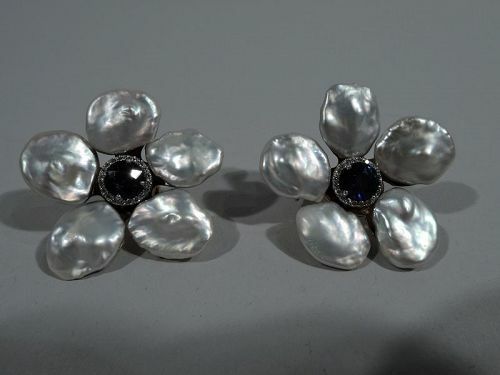 Pair of Biwa flower clip earrings by Seaman Schepps. Each: Five keshi freshwater pearl petals surrounding a faceted sapphire (approx. 1 ct) bordered by brilliant-cut diamonds. Mount 18k gold. Signed “Seaman Schepps 750”. United States, mid-20th century. Excellent condition.